The Dominican city of Santa Cruz de Barahona, or simply Barahona, is the head municipality of the Barahona province, on the southwest of the country. It is the largest city of the Dominican southwest and the centre of the region. Since the 18th century, the region was occupied by fishermen and people that came here to cut trees. When Toussaint L'Ouverture took the eastern part of the Hispaniola island in the name of France, he gave the order to create the town of Barahona in 1802 as part of the Ozama Department. After the Independence in 1844, Barahona was a military post of the Azua Province. 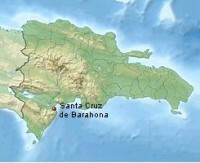 In 1858, Barahona was elevated to the category of municipality. When the province was created in 1881, Barahona was made its head municipality.